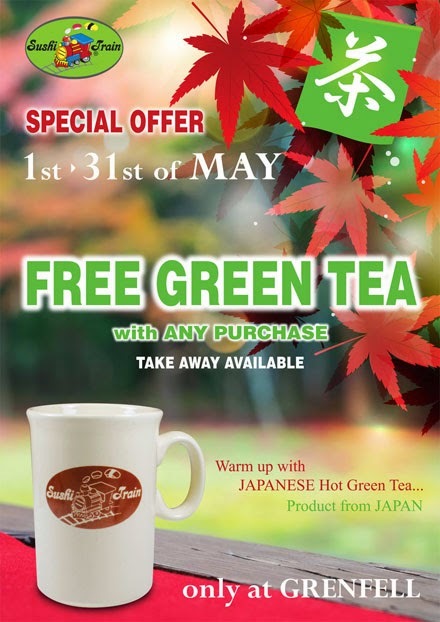 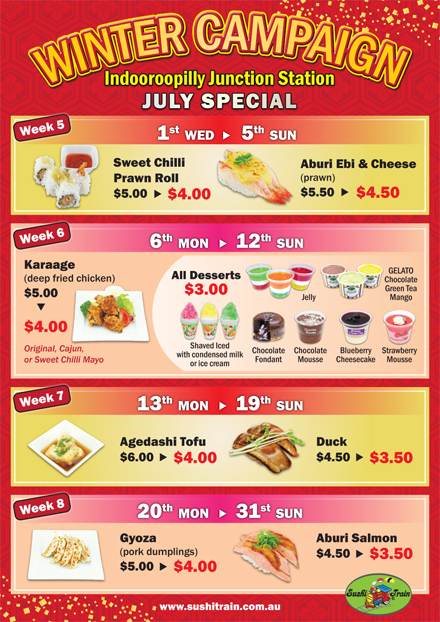 Udon, Rice Bowls and Drinks etc are excluded from specials. 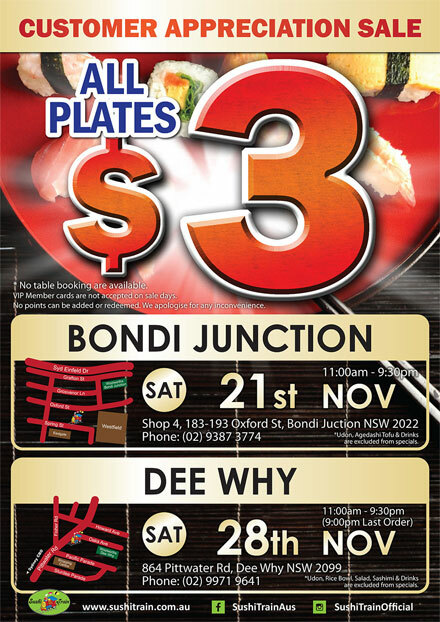 Udon, Rice Bowls, Sashimi, Kids Meal and Drinks are excluded from specials. 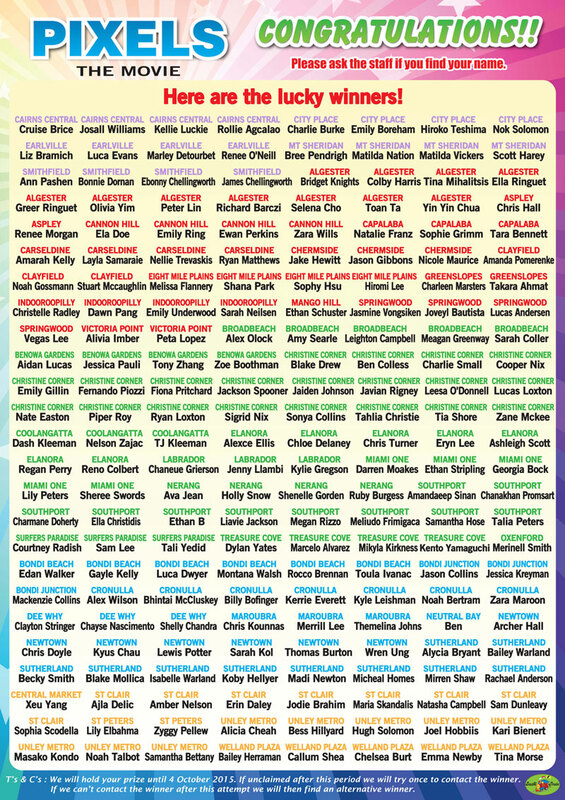 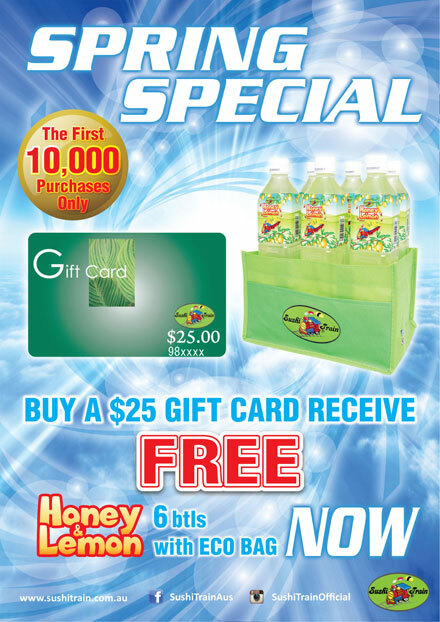 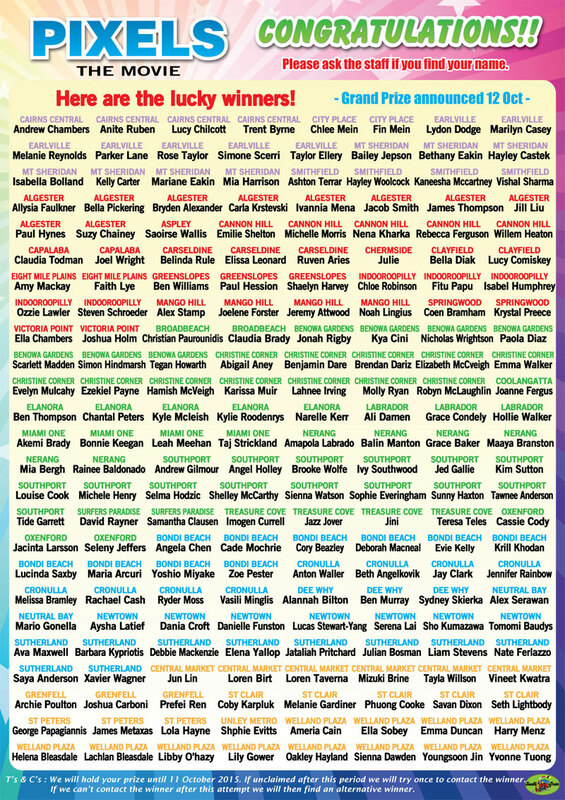 VIP Member cards are not accepted on sale day.No points can be added or redeemed. 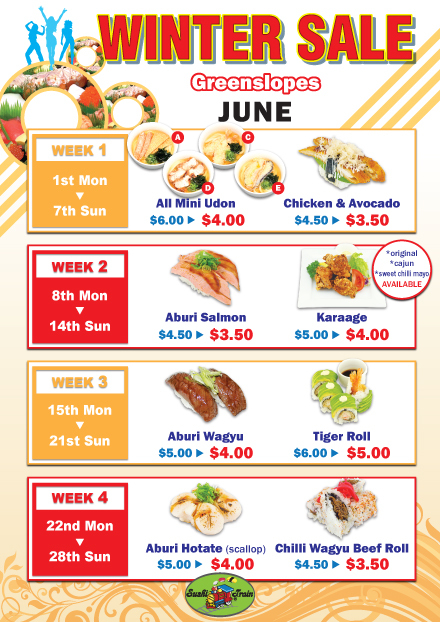 Udon, Rice Bowl and Drinks are excluded from specials. 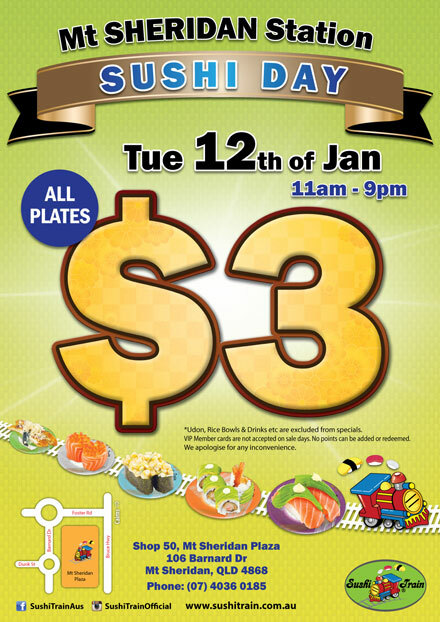 No table booking are available. 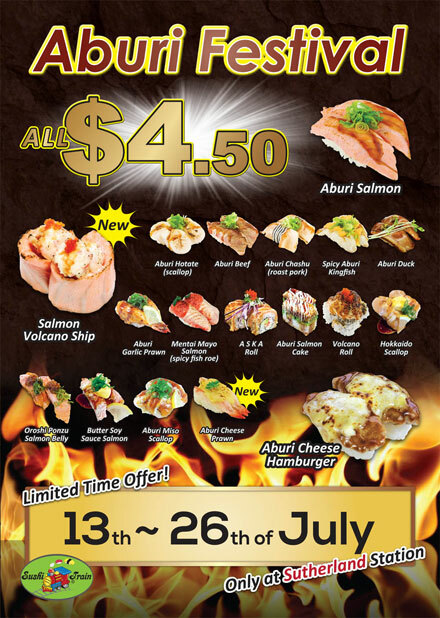 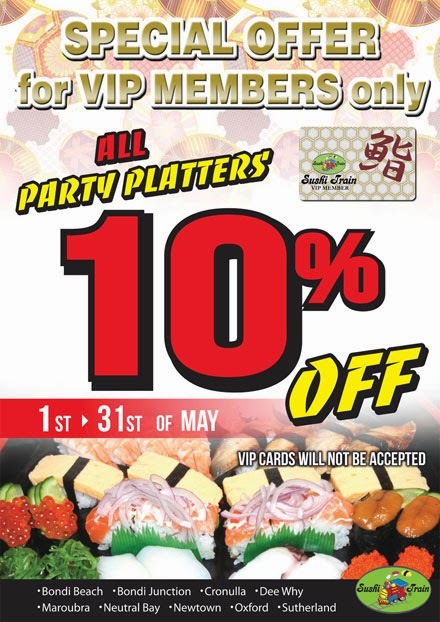 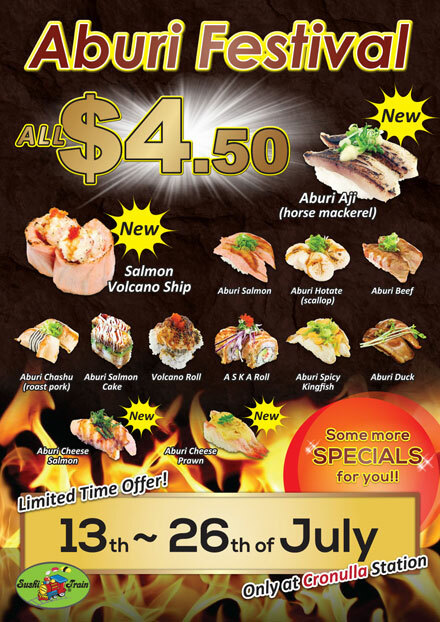 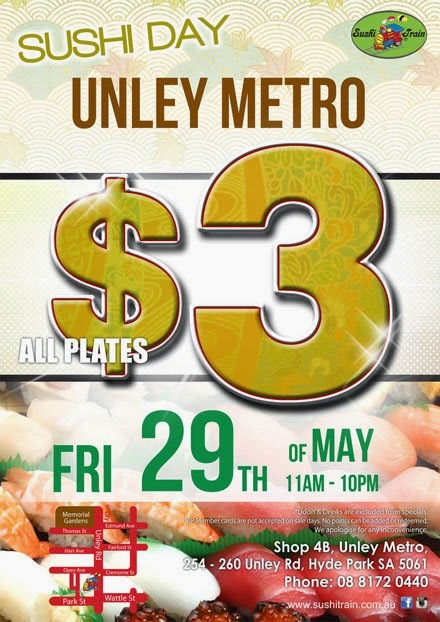 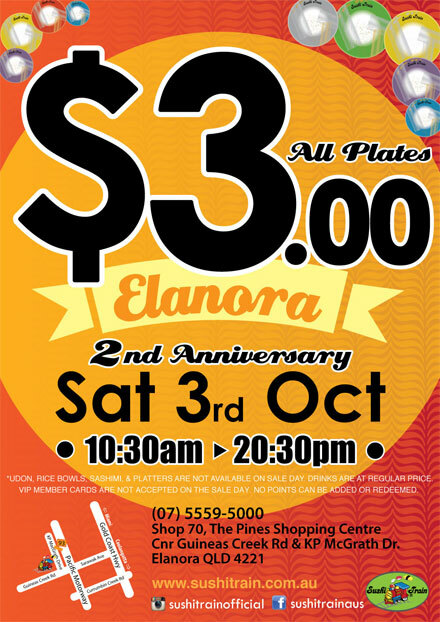 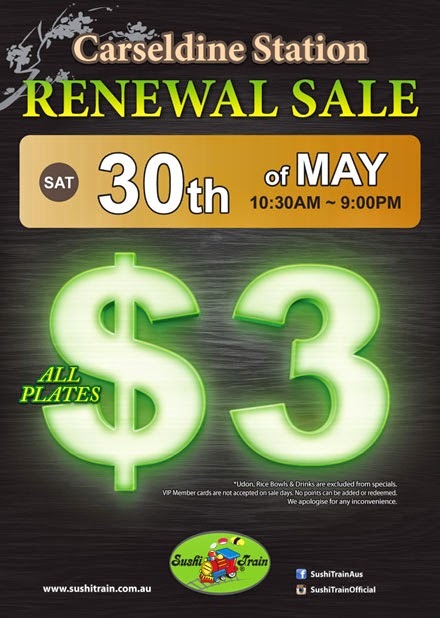 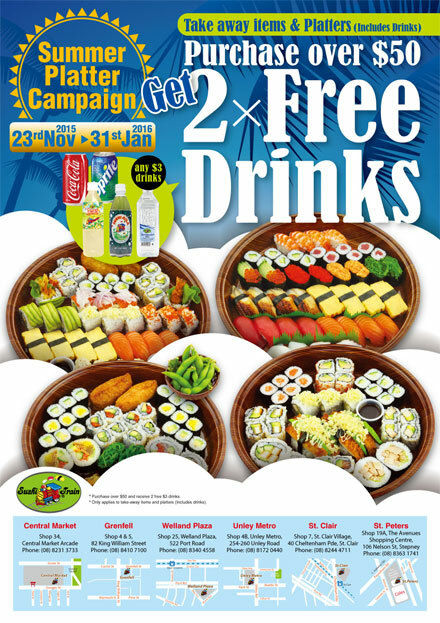 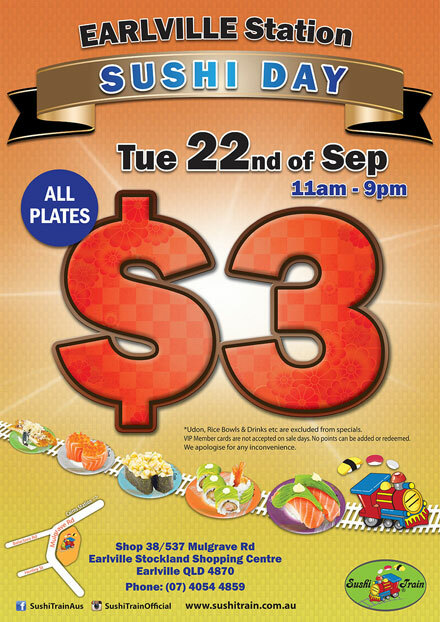 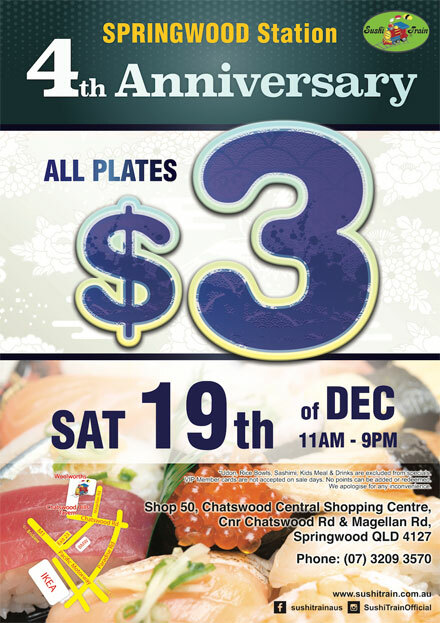 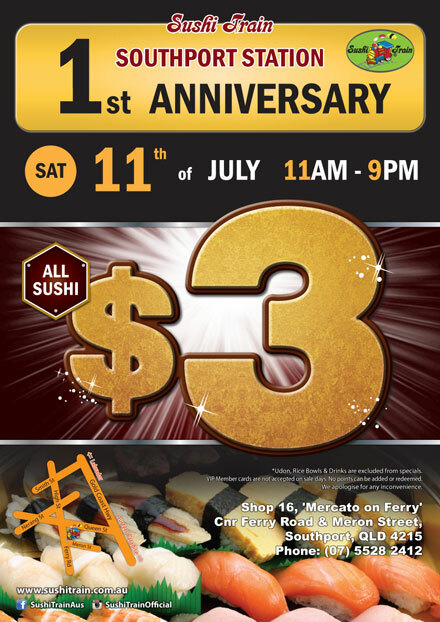 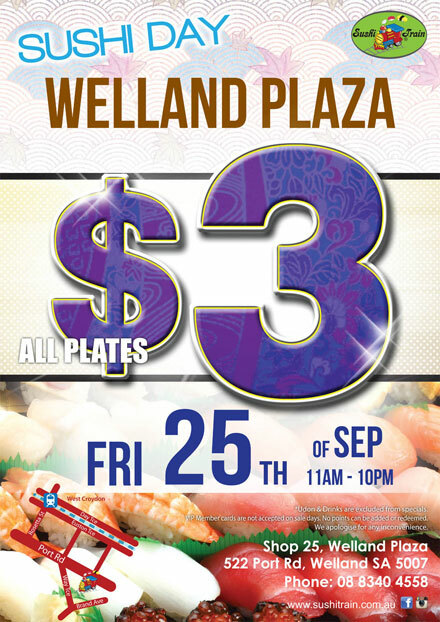 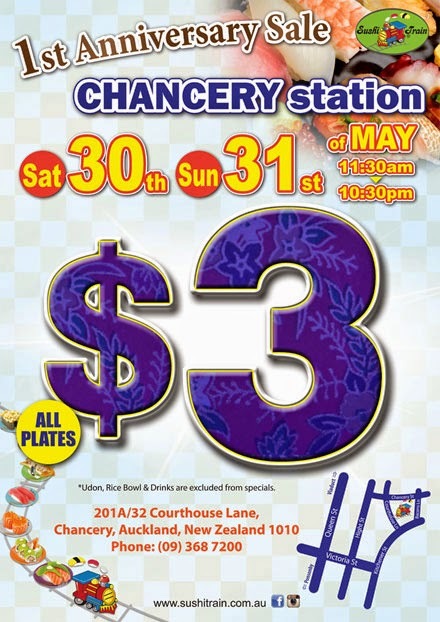 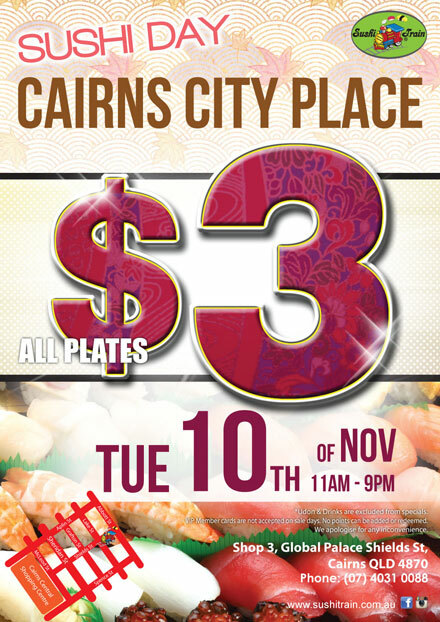 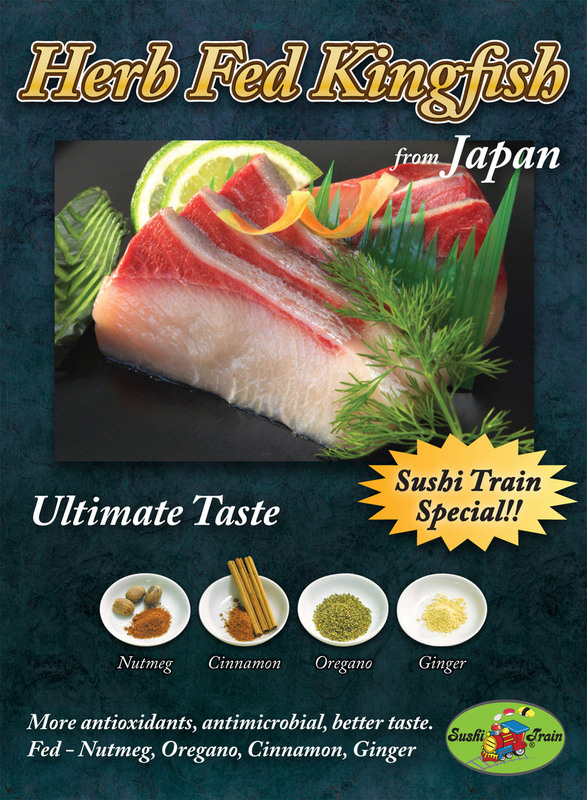 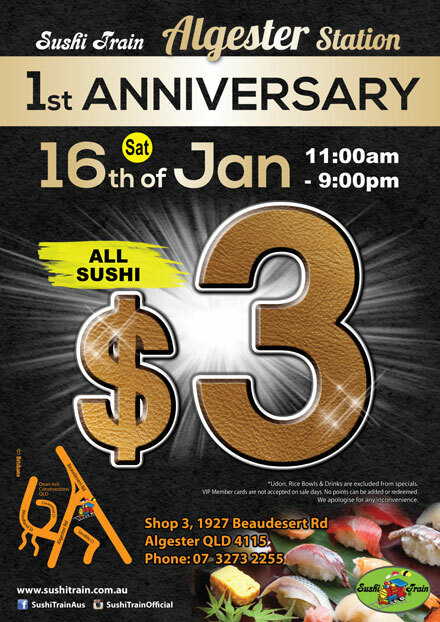 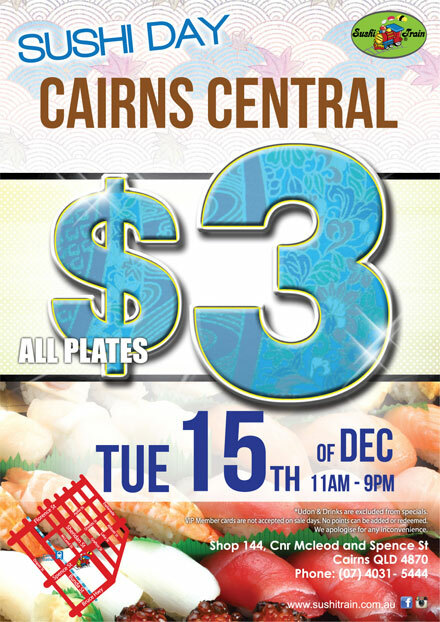 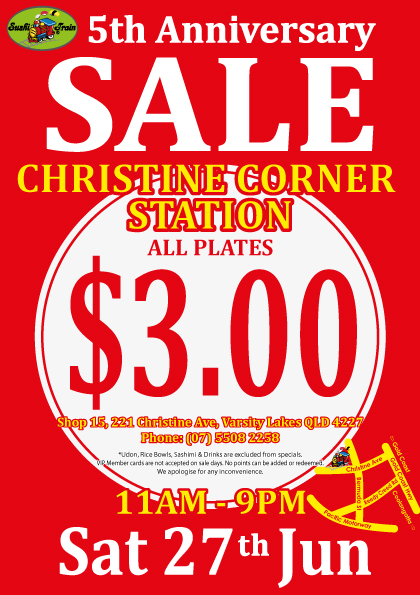 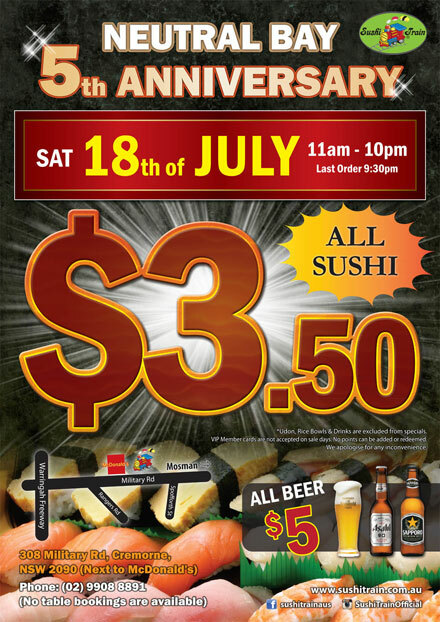 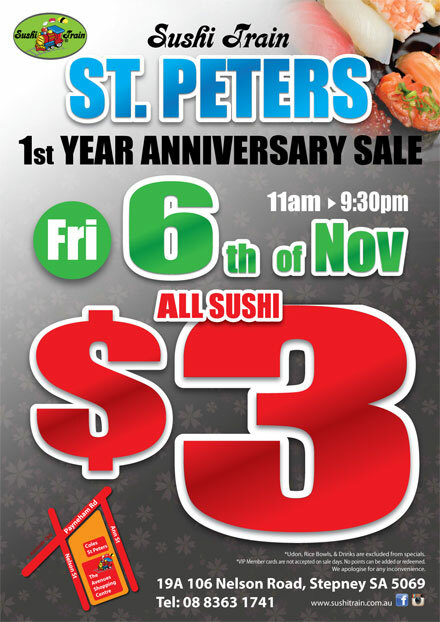 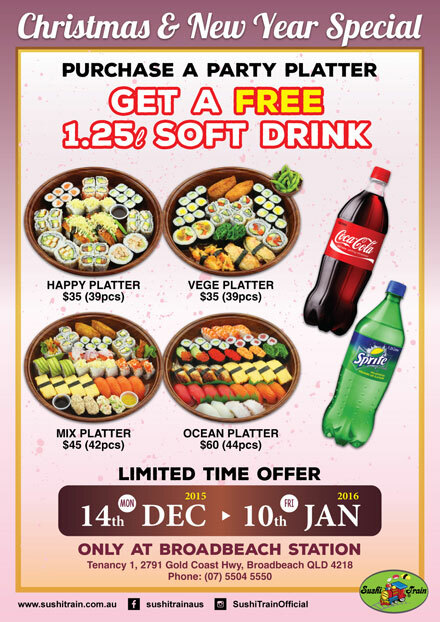 Sushi Train Welland Plaza Station Sushi Day $3 Sale! 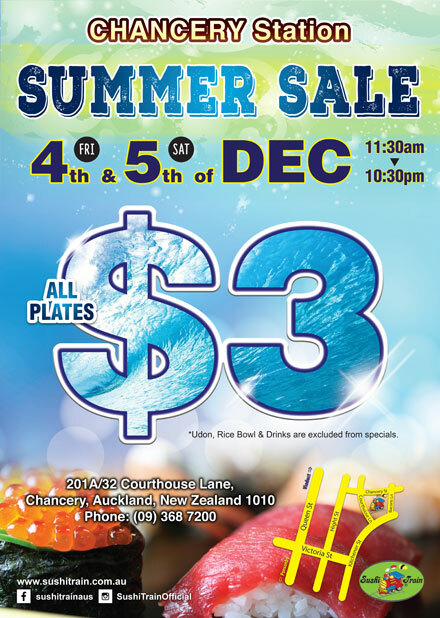 Campaign conditions do not apply during the sale day. 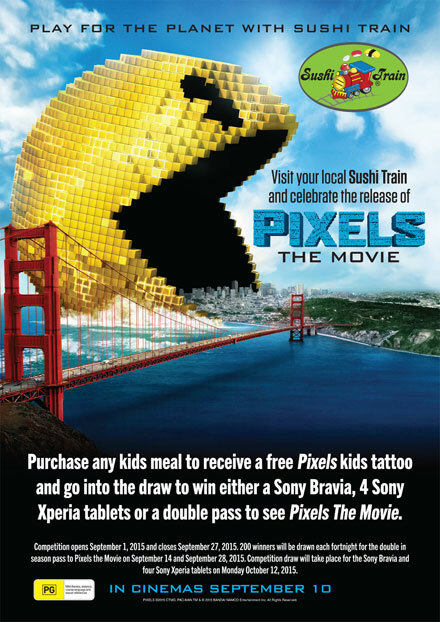 Purchase any kids meal to receive a free Pixels kids tattoo and go into the draw to win either a Sony Bravia, 4 Sony Xperia tablets or a double pass to see Pixels The Movie. 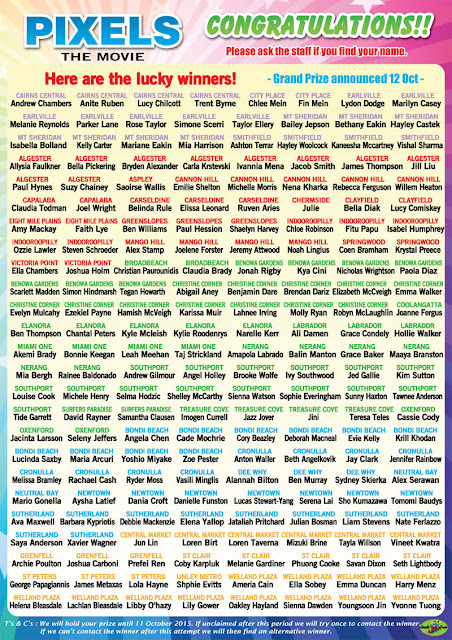 Competition opens September 1, 2015 and closes September 27, 2015. 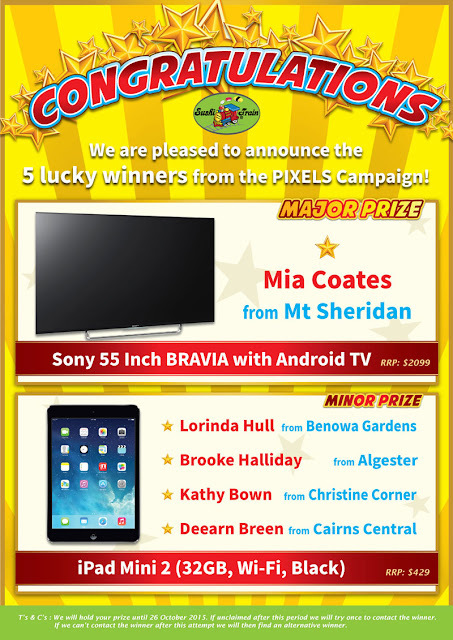 200 winners will be drawn each fortnight for the double in season pass to Pixels the Movie on September 14 and September 28, 2015. Competition draw will take place for the Sony Bravia and four Sony Xperia tablets on Monday October 12, 2015. 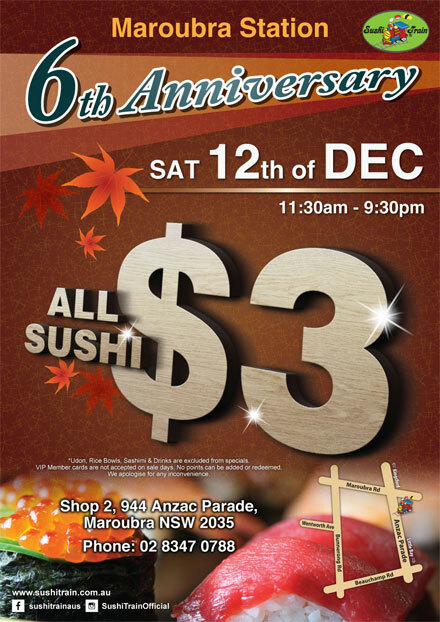 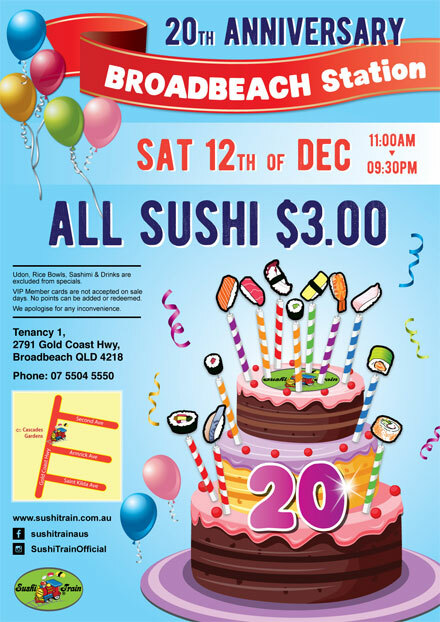 Sushi Train Clayfield Station will be closed at 20:00 on Tuesday 11th Aug, due to maintenance. 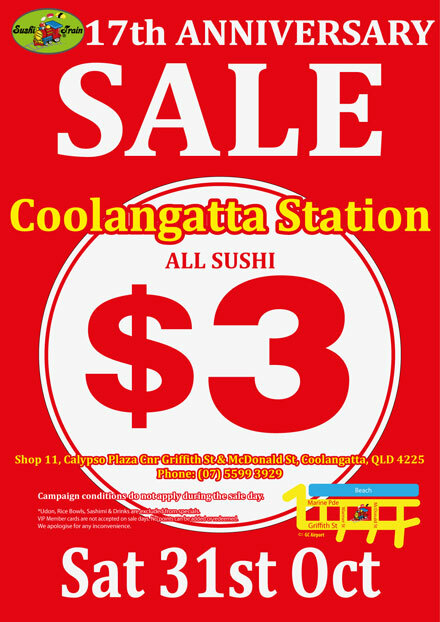 Management of the Sushi Train Clayfield Station. 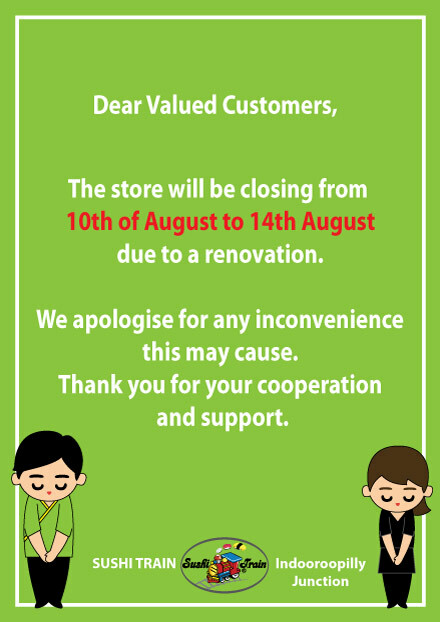 Sushi Train Indooroopilly Junction Station will be closed from Mon 10th Aug 2015 to Fri 14th Aug 2015, due to a renovation. 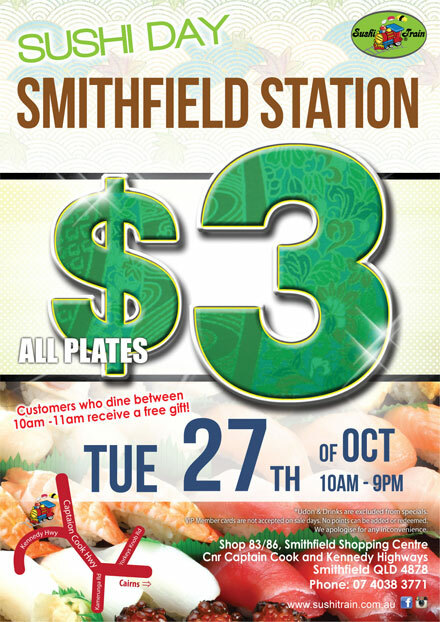 Management of the Sushi Train Indooroopilly Junction Station. 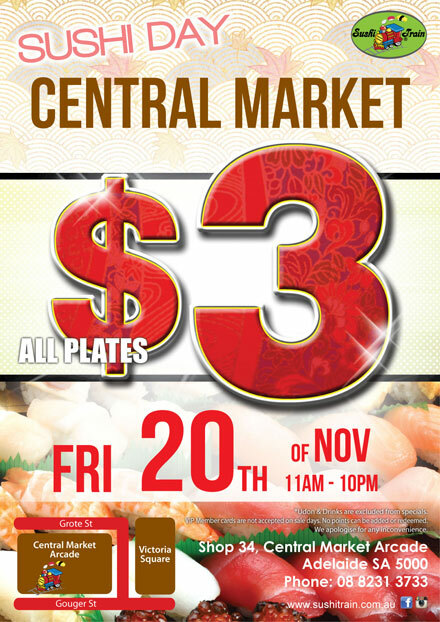 Udon, Rice Bowls, Sashimi, Platters are not available on the sale day. 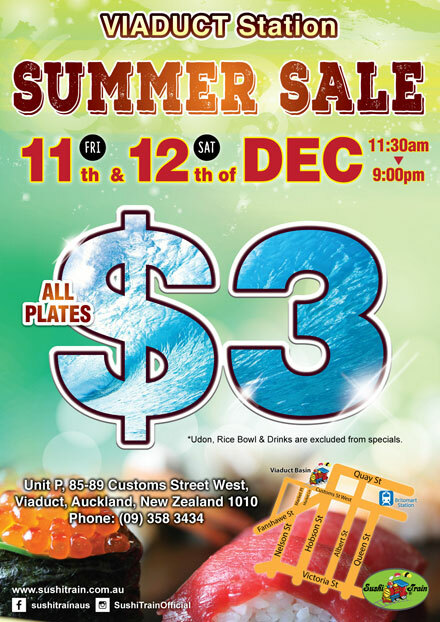 Drinks are at regular price. 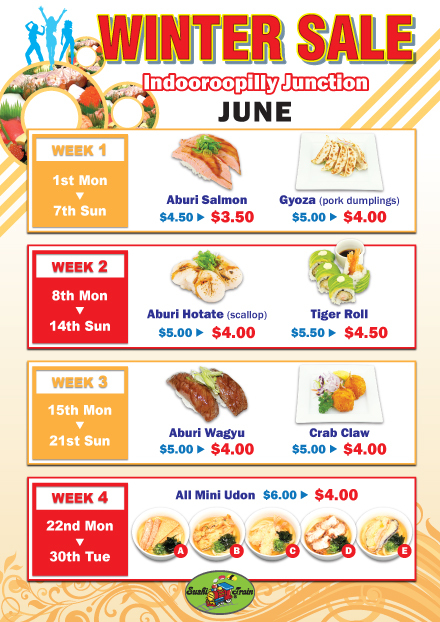 Udon, Rice Bowl, Sashimi and Drinks are excluded from specials. 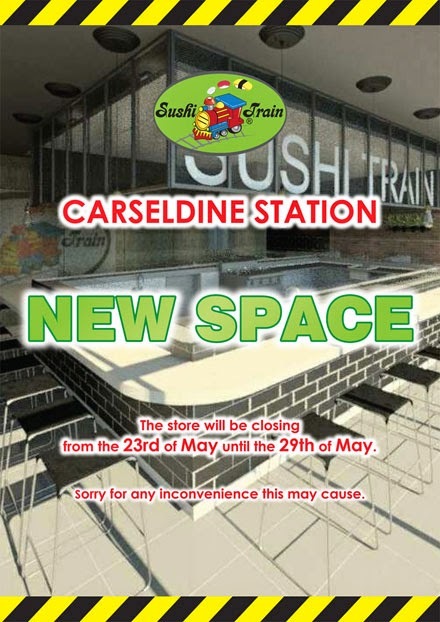 Sushi Train Carseldine Station Minor Renovation. 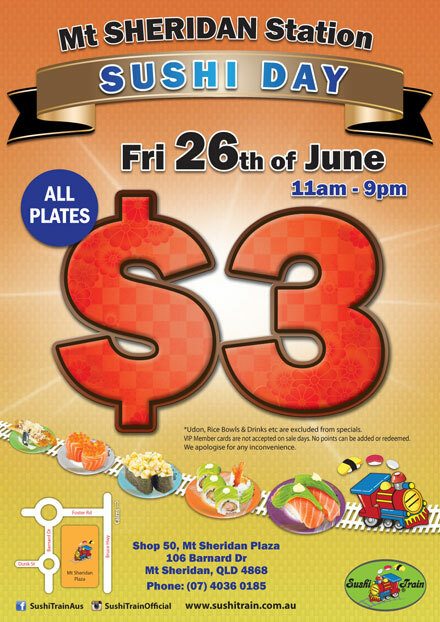 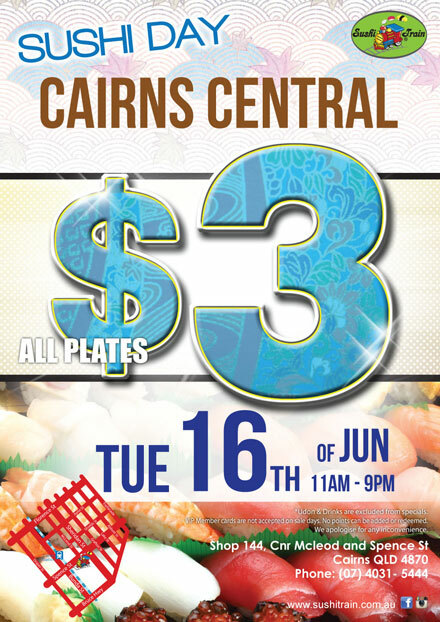 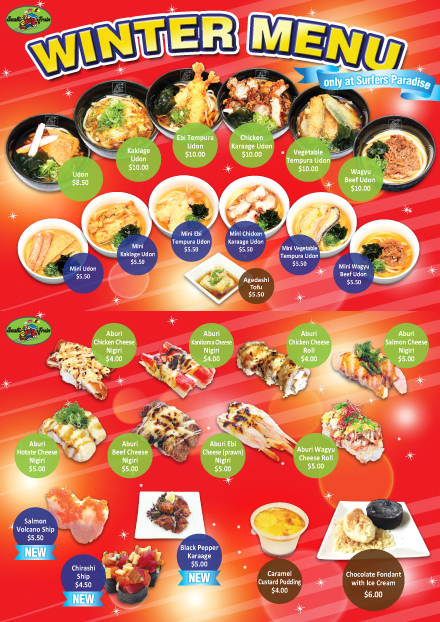 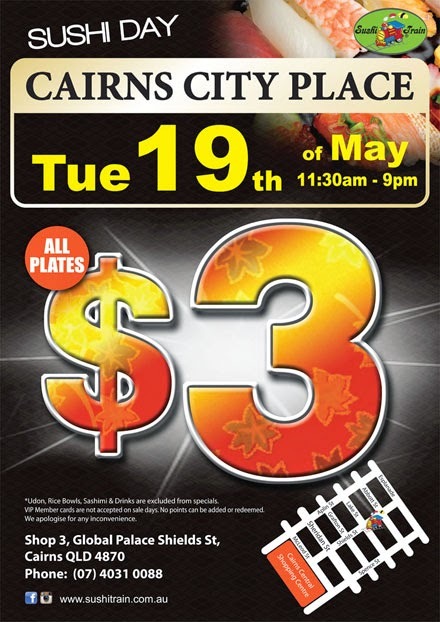 Sushi Train Carseldine Station will be closed from Sat 23rd May 2015 to Fri 29th May 2015, due to the minor renovation. 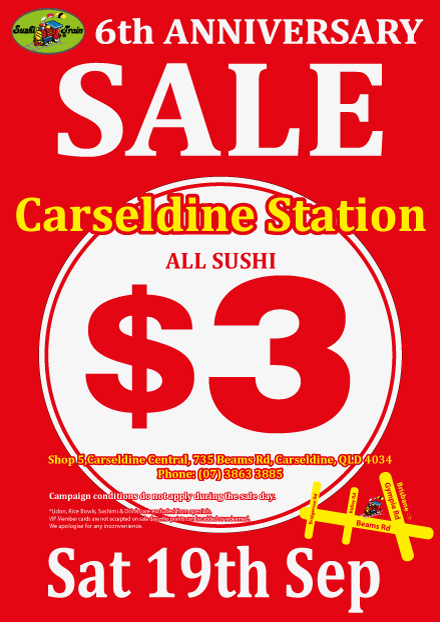 Management of the Sushi Train Carseldine Station.